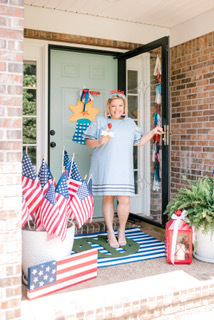 It’s patriotic, it’s simple, it’s adorable, it’s affordable, and it’s soon fun! Check this fool proof topiary out. Could it be any more perfect for Memorial Day and July 4th? All you need is a flower pot, floral foam, flags in a variety of sizes, and moss or straw! 1. Cut a piece of floral foam that fits perfectly into you flower-pot. 2. Starting with your larger flags in the center on the foam, insert those into the floral foam. 3. Sporadically add your medium size flags around the larger ones. 4. Insert your tiny flags as a filler for all of the space left. 5. Cover the floral foam by using straw or moss to lay right on top of the foam. Do you have any mini flags left? Add those to your flower arrangements or even potted plants! We filmed our first Facebook Live video on making this DIY topiary! Click on the link to watch and share with your holiday decorating friends. Also, follow us on Instagram to find the newest holiday DIY crafts happening around the Certified Celebrator home. This post is part of the Memorial Day series. Look back at the last 2 post for more patriotic ideas.